With the corpse of Pinochet, they think they can bury all those dead standing in the way. But in order to erase the face of Pinochet from the face of Chile, they should do what they did in the past with the ancient kings: he should be buried with all of its belongings –his army, his State, his innumerable pages of laws and his Constitution. His death is only making obvious the various contradictions in today’s Chile. The Easter 1916 rising in Dublin is often portrayed simply as nationalist blood sacrifice but it can also be examined as an insurrection which was seriously planned to defeat the British army. It is credited with transforming political attitudes in Ireland, leading to the partally successful war of independance but nationalist histories tend to understate the other reasons why the situation was transformed and to completely ignore the wave of workers struggles that broke out during the war. 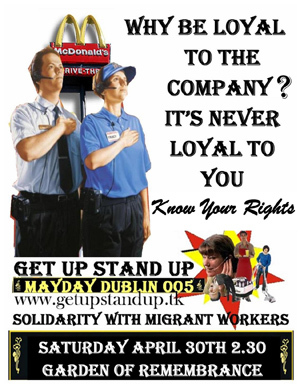 The Independent Workers Union (IWU) is a new small Irish trade union which stands outside the partnership consensus and is attempting to build a radical trade union. Over the past year there has been an emerging preoccupation among anarchists and socialists with precarity as it’s an expression of a new work discipline imposed by neo-liberalism. Already there have been several precarity forums in European cities aimed at etching out a sense of the identities formed through the shared experience of the demands of job market flexibility. Organising with the T&G, and beyond? In the UK union membership has been in steady decline for the past 25 years, not least due to how people are being employed - casualised labour, increased imposition of agency work, temporary, short term contracts & contracts of ‘self-employment’, along with the general lack of confidence in unions after years of complacency, compromises and defeats. Last September saw a split in the USA’s Congress of Trade Unions, the AFL-CIO. The Change to Win Federation held its founding convention in St. Louis, Missouri, where they set out their plans: cut down on bureaucracy, devote a lot more resources to organising the unorganised, and start building industry-wide super-unions. Caoimhe Butterly, who has spent the past five months in Lebanon and who experienced the results of Israel's onslaught last year, will be back in Ireland briefly at the end of January. During her visit, she will speak on her experiences in Lebanon (in both Beirut and the South) and will be highlighting projects that she is currently involved with (including a film project about life in the wake of the Israeli bombardment and invasion). Revolutionary martyrs, being unable to speak for themselves, are liable to be claimed by all sorts of organisations with whom in real life they would have had little in common. When they are of national or international importance, like the Irish syndicalist James Connolly, this also mean that biographies often tend to be very partisan affairs, aimed at recruiting the dead to one cause or another. The story of their life becomes reduced to a morality tale whose conclusion is whatever positions the author holds dear today. On Sunday Sinn Fein voted to support the Police Service of Northern Ireland at their extraordinary ard fheis which was attended by approximately 1,000 delegates. The vote, which was recorded by a show of hands, came after 6 hours of debate and a series of amendments which Sinn Fein claim will “enhance the proposal”. The build-up to the ard fheis saw an unprecedented amount of positive press for Sinn Fein with the media calling today’s event a “historical moment” and suggesting that the party has finally matured beyond it’s revolutionary past. A Sunday Business post poll stated that 56% of people questioned would be more likely to vote for the party if they support the PSNI. Anyone who has had a child in primary school over the past couple of years has no doubt heard of the ‘Tesco Computers for Schools’ scheme whereby in return for vouchers collected when you do your shopping, Tesco give ‘free’ computer equipment to schools. You’ve probably also heard about Tesco’s ‘Sport For Schools and Clubs’ and SuperValu’s ‘Kids in Action’ schemes. If you’ve seen the TV ads for the SuperValu version, you’ll probably associate SuperValu with healthy, happy kids. Revolt Video Film Screening of Chomsky Talk which took place in the Teachers Club last year.